if this is not acceptable to you. as his next of kin. because of his sympathy to my cross. administration from the appropriate probate registry. assistance. I hope I have not asked for too much. strictly between the two of us. Gee. He can�t reach me� I wonder why?��. Subject: RE: FROM JACKY JOHNSON. If this guy can�t read, I won�t e-mail him back� but soon enough�. Thanks for your mail and the interest you have shown so far. I called as you requested so that we can talk a little but your phone was on answering machine though i dropt a message. Could you please tell me the best time to call and have you on the phone. further correspondence to me here. good and kind hearted people in this wicked world. to you. Particularly the legal process and all. try and call me so that we can discuss a little concerning this transaction. Sorry about the phone thing. I am having difficultly with my phone right now� I broke it last weekend while skiing. Unfortunately, I fell pretty hard and not only broke my cell phone, but I hurt my knee pretty bad� a large branch punctured my lower leg, sending me to the hospital. Anyway, the guy at the phone store sad that unless I wanted to buy a new phone, it would be two to three weeks for the new microphone to come in. So for now, I can receive voicemail and that�s about it�. I just have one question� Why don�t you just get the money and leave the country by yourself? Wouldn�t that be easier? If you don�t tell your stepmother about the bank and the lawyer, just take the money and run� If there is some reason that you can�t do this, let me know�.I don�t want to split the money from you� I have enough to live on myself. Your father left that money for you. You should probably still give the lawyer some though� that was really nice of him to tell you and not embezzle it or something. Wow, this guy doesn�t know his American seasons� there is no Snow in Vermont in August!!!!!! Plus, I am such a nice guy for wanting to help him without getting any of the money back in return�. How is your health? guess you are getting better now. i hope the knee injury you sustained from the skiing accident is not much. i am praying so that you will get better as soon as possible. i love skiing, i always watch it on the TV unfortunately we do not have snow in Africa. Dear Friend, i am really touched and moved when i read through your mail and you said that you are comfortable and would not like to split the money from me. i have liken you courage to that of my Father's attorney . you are really the kind of person to deal with, please i will always like you to take some money out of the whole sun for your assistance. However, i discussed extensively with my Father's attorney about what you suggested to me regards to collecting the money and traveling out of Africa. The attorney told me that, that wouldn't be possible for me to move the money from here alone. he advised me that moving the money out Nigeria will only be possible through money transfer. you can agree with me that the money is large and can only be possible through Bank to Bank transfer. The attorney said that before the money can be transferred we must go through processing and getting approvals from all the respective agencies before the Bank can transfer the money into your account. Dear Friend, letting my stepmother know about the money is out of the question. my stepmother is EVIL. i would not like to near her again in my life time. Please i still rely on you for assistance to be able to achieve this my life time dream. i am taking my final year Exams and would like the money to be transferred into your account before two weeks time when i would be through with my Exams so that i would be in a better position to travel down to USA immediately. Time to Yak it up.. Make him talk� Get to know him�. Anyway, I have a third of my money invested in several large biotech�s, the rest is in S&P 500 venture capital funds and high yield bonds. I have a friend on the exchange, and she will sell everything very quickly in the event of a crash... Have been doing business with her for years and have great trust in her. I just realized that I have no idea what you look like... Could you send me a photo of yourself? Jacky has informed me that you are helping him get the money away from his evil stepmother... I too am willing to help... please let me know what you would like me to do.... You can e-mail me or leave a message for me at 1-240-248-7655. My fax number is 1-419-828-7772 if there are any documents you need to send. How are you today? guess you are doing fine. i am sorry for replying late. i am just coming out from my Exams now and managed to go into a Business center to reply your mail. how is your health generally? i am sure you are better now. You are such a wonderful man. i can't wait to meet you. you are really one out of many who has the chance to make money and decided to stay off it. i can't believe it, your kind of person is had to see. i am happy to be assorciated with your kind of person. I have not travelled out of Africa in my life. as soon as i arrived States where ever you want me stay is where i will be. i will naver have any objection to it. i pray that your Wife does not missbehave cos you are such a wonderful Man every woman will dream of staying with. Dear, as soon as i finished my Exams by nest week, i will be in a better position to go to the town where i can Scan my Picture and send to you as you requested. how old are you Sir? i will also like to have your picture too. it is really unfortnate that i can't talk to you on phone. i would have Loved to hear your voice. What i need from you at the moment is for you to contact the attorney as you promised so that you can discuss the best possible way to transfer the money into your account as soon as possible so that i can be with you immediately i finalise my Final Exams nest week. I will be waiting to read from from you urgently. God Bless You For Being There For Me. So, what are you studying? I did my undergrad work at Ima Baitman University (You might have heard of it as IBU? ), back in '62 and my graduate work at Harvard in MA finished in '66... Unfortunately IBU closed in the seventies after some big scandal.... I have a BA in Psychology and a Masters in Business Administration. I attached a picture for you... It was taken in June when we had our new staircase put in.... do you believe that that thing counts as a fire escape!?!?!?! I am just trying to figure out what I am going to do with my wife... What do you do to women who commit adultery in Nigeria? OK, I made it pretty Obvious for him that I was a baiter.. �Ima Baitman University)???? Come on Jacky, you got to work harder� This is a picture a friend sent me of a really neat slide/stairway. How is your health today? i am very worried that you are going through alot of pains now. i pray that God in his infinit macy will surely take care of you so that you will be up in your fit again. Hieny, i have seen your picture, you are a very hansom Man. you are really what a Man should be. every right thinking woman should be comfortable with you. from what i read in your mails you are a comfortable Man and your Wife won't tell me that you are not taking care her. it is really unfortunate, God knows that you don't desave to be unhappy now you are sick. You left School pretty long time. i am studying Industrial Chemistry at the University of Lagos Nigeria. i am actually happy that in a very short time i will be out of School cos i have been going through alot of problem all this years i am in School. i hope and pray that the money will be transferred into your account as soon as possible so that i will immediate come down to America to have a new life. Hieny, i am sure that the Doctor has removed the peice of wood in your leg. please nest time you are skating try and be careful so that this kind of injury do not occur again. i really feel for cos i know what your are going through now, this type of injury can be very painful. why did the doctor allow the wound to smell, if the Doctor is not treating you well why not change to a better doctor that can take care of the wound quick so that the injury does not result to another thing. Hieny, I love your house, you are living in a HOME from the little i see in the picture your house is good. i love it. my Dad built a good house too but it is unfortunate that the wicked woman never allowed me to enjoy my Father's house. God will surely pay her back. i am suffering, i am surviving through the help of God it has not been easy since i lost my Dad. Please bear with me i have bean very tight with my Exams. i will surely send the picture to you as soon as i go to the town where i can Scan the picture and send to you within the week. However, i have this morning handed over some of the documents in my position concerning the money my Dad deposited with the Forum Bank. the attorney told me that as soon as you respond to his mail he will send the documents to you for your perusal and records. please i am aware that your are going through alot of pains now. please try and respond to his mail so that he can send the documents to you and the nest step for us to take to conclude this transaction as soon as possible. i want to thank you for the assistance you are given me even when you are going through pains. God will surely take care of you in this trying time. Hieny, i want to advise you about the way your Wife is behaving. as Christan's we all do know that adultery is bad both in the eye of Man and God though in my little experience here in Nigeria such act usually lead to devoice but i will advise you to call your Wife and caution her from such attitude, she may not understand the consequences of what she's doing. my main concern is your happiness. i really want you to be happy. i wish i am there to take care of you now your sick. does she actually take care of you? i will continue to pray for your quick recovery ok. Please try and respond to the attorney mail so that we can move forward to finalise the transfer into your account. Dear Hieny, i have Scaned the picture but i am having problems attaching it through XXXXXXX. if i try again tomorrow if it did not attach. i will try and creat another Email account with Yahoo to send it to you. I have to go back to School before is late. THIS GUY IS AN IDIOT!!!!! His opening Email clearly said he was male!!!! �My name is Jacky Johnson, the son of late�.� PLUS, The Moron has called me TWICE!!!!!!!! IN A DEEP VOICE!!!! I am going to play Dumb�. Dear Jacky� I will write you more when I get out of Work� The President needs to be babysat through another board meeting� What an Idiot!!!!! The picture that you sent did not work.. I wouldn�t open� Could you re-send it again? Subject: RE: HERE IS MY PICTURE. I am happy you recieved the picture i sent to you. i am surprised that you are doubting whether i am a Man or Woman. i can not be a woman and send to a picture of a Man. I am a Girl not a Man as you can see from the picture. what i sent to you is my picture. i can still send more to you if you want to do so. i could not sleep last night because of the doubt you are having on me. you shortly. Thank you for your patronage." >How are you today? guess you are doing fine. >arrive you will find time to teach me how to play pool. >try and conclude with the attorney as soon as you receive his mail. >Please Update Me As Soon As You Hear From The Attorney. >Have a nice weekend and God Bless You. Eat right and exercise regularly, I hope will be able to find another woman somewhere� I don�t really care what others may think�. I have sent another mail to the lawyer�. I sent you the following email on Thursday from our lawyer.com email address. I am suprised you did not receive it. Perhaps something is wrong with the server. This is why I am now resending the email to you from this XXXXXXX address. We should continue to use this box as it is obviously more reliable. This is to acknowledge the receipt of your email in our chambers email box in respect of Jacky Johnson. The young lady has informed me of the arrangement she reached with you. I congratulate her for her wisdom. It is also quite noble of you to assist this young lady. She has been through a lot. In this country, when a man dies without a will, the law requires the next of kin(s) to apply to the Probate Court for a letter of administration which shall apoint him as administrator to the late man's money or property, whichever the case may be. In Dr. Obiagwu's case, he died intestate, without a will and as such, even Jacky or any one appointed by her must apply to the Propate Court for a letter or certificate of adminstration. This is the official and final document that the bank would need to see before the money can be transferred into your account. It is purely legal. 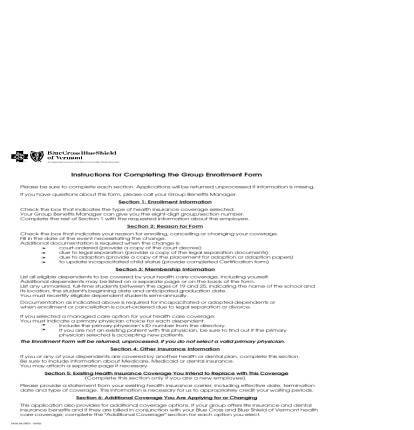 Without this letter of adminstration that shall appoint you as the administrator\next of kin to Dr. Samuel Obiagwu's funds deposited with Forum Bank, the Bank will not entertain any application from you and no transfer will be made into an account to be provided by you to receive the said funds. Yes, this letter or certificate of administration is the official and final document Forum Bank would need to see before she can authorise the money into your account. Since you are in agreement to help Jacky receive her father's USD29.5m in your account, we shall process it as an inheritance and present you to the probate as the next of kin/adminstrator to the said funds. That way you become the legal owner to said funds by inheritance. To commence the process of securing this necessary and prerequisite letter of administration issued by the Probate Court in your name, we willl need the following documents. a. An affidavit deposed by Jacky before the Commissioner for Oaths at the Probate Court to the effect that you are well known to him and his father and further agrees that you be issued with a letter of administration which will empower you to receive the money left behind by her father into your account any where you so desire. b. 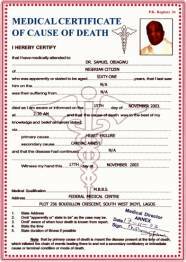 A medical death certificate which certifies to the fact that Dr. Samuel Obiagwu is actually dead. This medical document must be issued and signed by a qualified doctor in the hospital wherein Dr. Obiagwu died. c. A copy of the certificate of deposit which was issued to Dr. Samuel Obiagwu by Forum Bank at the time he, Dr. Samuel Obiagwu made the deposit. With the above, we shall submit and file our application at the Probate Court for a letter of administration to be issued on your behalf. d. The Probate Court will then require that you, the applicant, submit a three year tax clearance certificate of himself and that of the late, Dr. Obiagwu. This will be submitted to the Probate Court, upon which a letter or certificate of adminstration will be issued. Kindly inform Jacky to forward to me any of these documents in her possession. Thereafter we will only need to send a letter to Forum Bank informing them that we have obtained the certificate of administration. Of course, a copy will be attached to the letter to the bank. We will in this letter direct them to contact your bank and arrange on how to move the funds from one bank to the other. At that time, your bank will definitely know that the funds to be transferred into your account are legal, clean funds which you have received as an inheritance from Dr. Samuel Obiagwu through his daughter, Jacky. I will therefore require the following information to apply for the death certificate with which I shall attach to other applications to be made. Please send them to me as a matter of urgency. 1. Your Full Names and Address. 4. A copy of either your driver's license or international passport. You should scan it and send it as attachment to my email. That way, it would be clearer than when it is faxed. As for your account number that should receive the money from here by wire transfer, I will require that as soon as I am through with the probate. I will let you know then. With our experience at the probate registry and good will established over the years, we should be able to complete the entire process in a matter of 14 working days, of course, that all depends upon your active cooperation and participation. I am happy that you have agreed to take Jacky as a member of your family. The young girl needs a change of scene, far away from her step mother. If I may ask, what exactly do you do? Are you married? How large is your family? Please note that we shall begin the first process only and after you have sent the 4 items numerated above to our chambers. Remember to ask Jacky to forward any of the documents I have requested for that may be with her. SO. I jimmy up a Drivers License�. Why Yes Officer� I am over 21 (I actually am)!!!! Do you need any other info? I also attached my VDL. >Bank gave my Dad when he deposited the money. >of taking care of me and the money when i finally arrive the States. >Wife? is She still Living with You? >Please, Update Me As Soon As You Contact The Attorney. I am sorry to hear of your wife. I wonder why women are never content with what God has given them? What else would a woman want that she cannot get from you? From the way you talk about her, I know you must still love her. Please do not suffer more than you should. Women are not worth the trouble. This is why I never remarried after my first wife divorced me, but you can still try again, some people get lucky at the second attempt. Really sorry. I am writing to actually inform you that I have received your email and the driver's license you have attached. The more I look at your picture the more convinced I am that Jacky Dede Obiagwu could not have found a more better person to take care of her. Thank you for helping her out. I have no doubt the money her father left for her would be put into good use. It is already late here. First thing tomorrow morning, I shall proceed to the Probate Court and file the necessay applications in your name and on your behalf. As soon as it is accepted, the Registry will advise me of the percentage that must be paid into court in order to secure the certificate of administration. I will then write to you and let you know and also advise you on how to get it across to our chambers. I am sure Jacky informed you that I am willing to offer my legal services free of charge, that is, I do not wish that you pay me any professional fee, but I also informed her that expenses must be taken care of by you. I took Jacky to court today and she deposed to an affidavit on oath to the effect that the money left behind with Forum Bank by her father be transferred to you as her guardian and of course, next of kin to her. I shall attach this to the application I will make to the Probate Court tomorrow. In the interim, please find attached a copy of the death certificate issued by a medical practitioner at the hospital where Dr. Obiagwu died. The Certificate of deposit issued to Jacky's father by the bank at the time the deposit was made is too heavy to be attached here. I will call Jacky and ask her to send it to you through her email server. Kindly let me know if you were able to open the attachment and when you receive the other one from Jacky. OOps, the attachment could not go. It seems you have exceeded your mail limit. Please delete all heavy files in your mail so I can resend it again. Or better still, why not create a free yahoo mail account as I also intend to do tomorrow. I understand it is up to 100MB as against XXXXXXX's 2MB. WOW! This MORON bought the fake ID that I sent him!!!!!! I know some people who probably wish he worked in some of the clubs around here�.. I have to admit that I still have feelings for my wife� She is almost thirty years my junior though, so I guess that I shouldn�t be surprised� I guess I just have a thing for younger women�. What is this percentage thing??? Can the bank just take it out of the money in the bank�. I have to be very careful with my money until the divorce is finalized� I actually have incriminating photographs of her involved in extramarital activities, so she shouldn�t be getting much� No more than three or four big ones�. I just heard on the news that there may be a war in Nigeria� It was something to do with the Oil supply and that the rebels are demanding that all Oil production be stopped� What is the News from your end? I just heard on the news that there may be a war starting in Nigeria on Friday!!!! Do you have someplace safe to go? I would get out of Lagos if something big happens... Maybe even leave the country!!!! Good luck!!! I am really stressed out right now� I think I am going to go get a massage� That would be divine�. There is a new place down the road that just opened� It gives Oriental Massages� I wonder what the differences are between a Swedish massage and an oriental massage? Thanks for your mails. the country is still safe but one can not say what will happen the nest minute. Dear Hieny, i am handicapped if some start up here now i can not be able to move cos i do not have money to make any move now. i hope in God that nothing happens. I can understand the way you feel. just take it easy. i am happy that she has started regretting what she did cos from what you said, she had already made up her mind to hurt you. Hieny, you just have to take it easy and be a Man. most times this kind of thing does happen but the area i am worried about is why you. Just keep being good God will surely reward you. does she have Kids for you? please do not take any action without your Lawyers advise. you have to be alot careful this time around. are you sure that after forgiven her she won't go back dating your Boss again? however, just think about it and know how to handle the situation ok.
My advise is that you can forgive her but she has to prove to you that she won't do that again. Thanks for given the attorney the informations he requested from you. i have always counted on you, i called the attorney yesterday and he told me that he has been finding it difficult to attach the documents to you. he also said that he ask you to open a new email account. please try and find time to register a new email account so that you can have the documents. concerning the Date Certificate you said that i should send to you. i have to travel to the city to take it from the attorney so that i can Scan it and email to you cos i have already handed over the Certificate of Deposit and the Date Certificate of my Dad to the Attorney. I am aware that you are not happy, just have your cool and live your life. let it not trouble you much ok.
First I attached the Forum Certificate of Deposit from my lawyer.com email address. I tried to attach the death certificate to this email, but it returned with a message that you have exceeded your limit. Kindly delate somethings and inform me so I can resend the Death Certificate to you, just for your record. Let me know if you actually received the Forum Certifiacte of Deposit. You have asked if the cost of the entire process could be taken from the money. No. The money is in a fixed deposit with Forum Bank and in the name of Jacky's father. It is only Jacky's father that would have had access to the money were he to be alive. Now, before you can have access to the money, the Probate Court must first appoint you as the administrator or next of kin to the late Dr. Obiagwu. It is only with that certificate that you would be allowed access to those funds. It is therefore logical that you must expend money to get the certificate of administration in your name in order to have access to the full funds. You said you are saving all your money for your divorce. I want to assure you that there would be no need to save any money. I can facilitate things here so that the money would be sitting in your account before the end of next week. Let me know if you would want that. As such, you would have enough by the time you are ready for a divorce. It is good that you still love your heart, shows you are a good woman. If you must let her go, then do it peacefully and get on with your life. You will be okay. No, there would not be any civil war in Nigeria. Not in the near future any way. These problems are fuelled by internal interests and would be taken care of. Yes, you can also call me, Tony. I just tried sending the documents again, but it bounced back at me. Listen, your XXXXXXX account is only 2mb and the two documents together is about 2.2mb or so. If your account is empty, one may likely scale through. However, to make further and quick progress, I will suggest that you go to yahoo.com and create a new email address. Yahoo can give you up to 100mb. Please create it and email me back with the new address so I can resend the documents. I shall update you on progress made so far later in the day. Thanks for your mail. i called yesterday so that we can talk a little but your phone was on macine. I will be expecting your mail as you promised. Mans Voice: Hello? Mr. Trapp� This is Jacky� jack� �. Jacky Johnson speaking From Nigeria. Um� forget we we supposed to be female now? Did we? So, what do I need to do with it now? (I have a really busy week lined up, so can we make this as simple as possible???) I am going through with the divorce with all due haste, as I found her in bed with yet another man... God!! I HATE HER!!!!! But she won't be able to hurt me anymore!!!! I have a really busy week ahead of me, so I have to keep this brief� I am going through with the Divorce as fast as possible because I found her in bed with yet another man!!!! Well� I�ll make it so that she doesn�t get ANYTHING!!!! I got the death certificate from the lawyer and I am waiting to hear from him on what to do next�. Still no response from Tony.. How are things with you? Thing are pretty bad here. I confronted Heidi last night about this new affair and she told me that she had been doing it with him from day one!!! She really wanted to marry him and only wanted to be with me for my money!!!! In the back of my mind, I knew it, but I didn't want to believe it... She has started drinking again... I think she knows that I have started the divorce proceedings.... She gets violent when she drinks, so I got a restraining order... Do you have restraining orders in Nigeria? Yesterday, I sent to your yahoo email address a very important and urgent mail. I am yet to get a response from you. Kindly check your yahoo email box and revert to me. Hope you are having a great Saturday. Thanks for your mails.i have been very sick for some days now, i am just trying to get better. i am also very worried as to what could be going on with you. it is unfortunate that this kind of thing is happening to you. i do understand the way you feel but please take it easy and handle the situation the best possible way so that it does not degenerate to another thing. This is on hard of. you curt her with another person again too bad. i was wondering what could be her problem? but now you said that she married you because of your money. such a woman is not good to live with, she can kill.since you have started the divorce proceedings it will be nice you do away with her so that you will live long. i am going to finish my Exams nest week. i will go to the American embassy on tusday to know what are the requirements to obtain a travling visa and i will inform you in my nest mail.i do not know which way to go now. life has been difficult for me. i thought this transaction will be concluded before i am through with my Exams. i am worried as how i am going to survive in the city, is alot easier in School than the city cos i have some Friends that usually assist when i am in financial difficulty. if we finish our Exams everybody will travel to its respective homes. I hope and believe that the attorney will expedite action so that this can be concluded as soon as possible. i am happy that you have been able to set up another Email account. Please Dear Hieny, try and take it easy. i really feel for you. Please try and always find time to write me. i feel much better each time i read from you. I am happy that you have now opened a yahoo email address. Communication will be smoother and stress free now. As you can see I have also created a yahoo email address just because of its convenience and size. Since the morning of Thursday, the 30th of September, I have been trying to get you on the phone. I even left voice mail twice for you to return my call, but you did not. I wonder if it is possible for you to give me a number I can reach you on so we can speak when it is very expedient for us to do so because we are now at the most crucial and important stage of the whole process. Yes, we have since made remarkable progress. Since we filed our application at the Probate Registry, serious progress have been made. Our file has moved severally and is now with the Probate Judge. Yesterday, the Probate Judge considered our application and ordered that we immediately pay into the office of the Probate Registrar the sum of $29,500 (Twenty Nine Thousand, Five Hundred Dollars). This fee is a requirement of the Probate law and must be paid by every applicant to a certificate of administration. Usually, the law stipulate 10% of the total sum of the estate of the deceased. In this instance, our application for the certificate of administration is in respect of the $29.5m with Forum Bank and 10% would have run into a few millions. We had to use our contacts and connections to prevail on the Jugde to reduce our bill to $29,500. As I write, this fee is the only obstacle between you and the $29.5m in Forum Bank. As soon as you send this money and payment is effected, the Probate Judge will automatically issue the prerequisite Certificate of Administration; with that Forum Bank will transfer your inheritance sum into your account. I want you to send this money as soon as possible. If the money reaches us immediately, I am sure the certificate of administration will be issued without delay and before the end of the week, the $29.5m plus interest should have been transferred into your account by Forum Bank. I shall be happy to provide you with the account information through which you are to remit to me the approval fee of $29,500 (Twenty-nine Thousand, five hundred US Dollars) as soon as I receive a response from you. Now that we are almost through with the necessary approvals to the transfer, please enclose the account details with which you intend to receive your inheritance sum of $29.5M from Forum Bank. This is very important if you do not want any delays after the issuance of the Certificate of Adminstration. In the interim, I have enclosed as an attachment a copy of the Certificate of Deposit issued by Forum Bank to Dr. Samuel Obiagwu at the time he made the deposit. How are you coping with your heart break? I hope you are letting go of your hold on your wife in your heart. Remember that bottled up emotions can destroy even the strongest man. Take it easy and take your medicine as a man. Here is my Trophy Picture pitch�. If I had know it would blow up like it did, I wouldn�t have tried so soon�. Sorry about the messages, my wife stole the phone, so I canceled service to that unit and had to get a new one. The number is the same though. How would you like the money transferred? I think the best way for me is to transfer it from my corporate account as an �African Personal Revitalization Project Loan� It will only take 24 hours to clear the money and is not much work on your part� My corporation can make gifts up to $45,000 with just my signature. We don�t even have to lie, since the money is going to help a young Nigerian National come to the US under my supervision. I have already filled most of the application, so I just need some info. Have your work address, but I need your home address. This is because I am listing you as the person responsible for these funds. 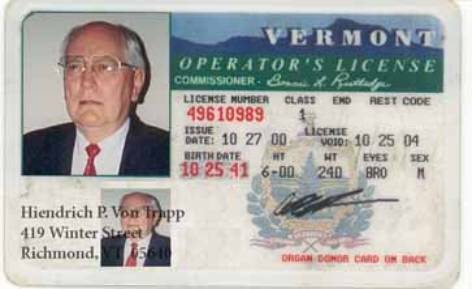 (Since you are going to bring the money to the court house) I also need an Identification number (like a passport number or something�) I just need the number though, no need to send your passport� Would this work for you? Also, I need a new photograph of you. I already have two of Jacky, which will work fine, but because you are to be listed at the person who is getting the money directly from me, we need a photo for the corporate security files� Just take one of you and hold a sign that says something like I like Hieny or Hieny is great or something simple like that� it�s really easy� An instant camera or digital will work just fine for this, so no need to have a professional do it� just have your secretary take it or your wife�. OH NO!!!!!! He�s ON to Me!!!!!!!! Thank you for your very insulting mail. I wonder what you think I am? If your aim is to humiliate me, then my friend, you did a shoddy job of it! I am highly insulted that you could ask me to condescend so low because you are sending money to me to render a service that will ultimately benefit you. If you have no confidence in my representation, then by all means, bring the money to my office personally. I am sure it will not be difficult for you to get a visa from the Nigerian Embassy in the US. I would be happy to pick you up at the airport. That way you can proceed to the Court with me and supervise the payment personally. In fact, this is the best way. I shall now inform Jacky that I am placing her file on hold till you decide whether to send the money to me as I have suggested or bring the money personally to Nigeria. Or engage an attorney that can have your confidence and trust. However, if you are sincerly not serious in your claim to assist Jacky, I believe you should open up to her, rather than waste her time. All she needs most right now is transparency and honesty from you. I really don't know why you are upset. All I did was ask you to accept the money... could you please explain the insult? I am not getting any of Jacky's money. I am helping her out of the kindness of my heart, as I though you were. You can ask her about that... All that I asked was that she pay me back when she got her money... why is that insulting? She is the one who has to pay me back, not you. I assumed that you would want the 29,500 sent directly to you, and not to her, as if her stepmother found out about it, then her life would be in danger. I don't know why this is a problem, I thought this would be the easiest way to proceed. I just needed this info from you so the file would be complete if the auditors came in. If you would like me to send the money directly to Jacky and risk her life, I am sure that we could make other arraignments. if it necessary, I am willing to come to Nigeria. I would rather not though... I keep hearing about the rebels getting ready to attack. Why are you mad? I really don't understand. I am just trying to make everyone happy. Maybe there is some kind of language barrier? Let me explain it more clearly. I would like to pay the court's fee's using funds from my corporation. I want to do this so that my wife cannot say to the judge that I am sending money to a secret mistress in Nigeria. To use this money, which is solely for use at my discression, I needed to include the information of the person to whom we were going to send the cashiers check, as well as the information about the person who the money is being used to help. For example if we were going to send money to help a baseball team in Africa, I would need to have the vital information of the Coach of the team, as well as each of the players of the team. None of these people is responsible for the money, but they would benefit from it, I just need to be able to show where the money went. In this case, because Jacky is going to be getting ALL of the money, (I am not getting a cent!) I needed to have her information, which I already have, as well as a picture of her, which she has already sent me. Since I am sending the money directly to you, all I asked was for the same information. This is not an unreasonable request. You will not be held responsible for the repayment of this money, Jacky will (If she gets the money from the bank). this should not be a problem since she will be getting a lot of money from this deal. You also gave no details about how the money was to be transferred. You wrote "I shall be happy to provide you with the account information through which you are to remit to me the approval fee of $29,500 (Twenty-nine Thousand, five hundred US Dollars) as soon as I receive a response from you." I am sorry I have offended you but I still believe that this is the best way to proceed. The money could be electronically transferred or I could send someone to deliver it (The second being my preference) Please let me know what I should do. Read your words that annoyed me. have your secretary take it or your wife�. I still consider it an insult. I just figured out why you might find that offensive. I stopped thinking about my name in that way a long time ago� Sorry about that�..
Can I count on �Jackie� for help? WOW! This guy is still with me!!!! YEAH!!! An early defeat is diverted!!! Thanks for your mails. how are you today? guess you are doing fine. i have gone through the mails you forwarded to me. i did not actually see anything bad with the mail you sent to the attorney. the only area i did not like is that you ask the attorney to take a picture holding something. to me that is not good. the attorney is highly respected here and will not do that. The attorney invited me to his office this morning and was complaining that you insulted him by all the informations you where requesting from him because of the fact that he ask you to send money to take care of the Certificate of Administration from probate registrar. i am very very confused because both of you are willingly trying to assist me. i do not know why this mix up is coming up at this time. the attorney told me that he has been working for people out side Nigeria and nobody has ever ask him to take picture and other things you where requesting from him before sending money to him to work for them. The attorney told me that he is not going to do anything concerning the transfer again until you come here to conclude the transfer yourself. i am afraid because i know that you may not have the time to come down here for that purpose. Dear Hieny, is their no other way this can be handled? i am really confused. Dear Hieny, since you said that you prefer the second option of given somebody the money to come and give it to the attorney personally. why not do that. the attorney told me that he be willing to welcome who ever you will be sending to him. the attorney stated it categorically that he will not continue the transfer until you come here personally. what do we do. all my hope is on you. i am sure that you are aware that i trusted you and i am comfortable dealing with you. please do not disappoint me. i never new that such a big amount will be spent before the money can be transferred. Please, what do we do? Well� Time to Call his Bluff�. Let�s see what happens if I decide to come to Nigeria�. (You can tell Tony that those kinds of pictures are common here as security measures. I have never met Tony, nor have I ever done Business with him. I was going to be sending him a large amount of negotiable currency, and I wanted to be able to verify his Identity.) I will speak with my travel Agent today. I will try to get there next week, depending on the flight schedule. I will fly into Lagos ASAP. >Thanks for your mails. i am happy that you want to make the trip your self so that everything will be concludede while you are here. i am very very prepared to come and pick you up in Port Harcourt on your arrival. i have also made inquries at the US embassy and i was told that i only requried a letter of invitation from you and a letter from my HOD in my School. i need to get an international passport here too. >Dear Hieny. i do not have money, could you please assist me with transportation to Port Harcourt? i need to fly to Port Harcourt cos it is very very far travelling from Lagos to Port Harcourt. >God Bless you the interest you have shown in me. > > > >Hi Jacky... Very busy week.. The divorce is progressing smoothly.. Were you able to find a hotel room for me? > > >Sorry, i could not reply your mail. i have been very sick and can not be able to do anything. i just managed to come and check my mail. i guess it will be nice if you can take care of the Hotel room from there. i am sick i don't know if you can assist me? i want to go to Hospital. i was told to run a Text on myself and i do not have money to do just that. > > >Awaiting Your Urgent Response. Jacky, I just got your e-mail message.. Are you still sick???? Perhaps I can help� I will be there on Friday at 10..
>I am sick and gething better. i am writing from the Hospital. the Doctor said that i should be discharged from the hospital within the week.the Dortor said that my bill is $2000. could you please help me. their is strike in Nigeria. i suggest that you wait until after the strike before you can make the trip. I already have my ticket, and according to CNN the conflicts shouldn't affect anything this week.. If it does, I've arraigned a friend of min who is in the Sudan to airlift me out in an apache attack helicopter. So I would get to ride in one of those... I will be there Friday. Please Let Tony know... He isn't answering any of my E-mails. Jacky is sick and in the hospital.. I know you are mad at me, but could you please go check on her for me? I will be there Tommorow with the full amount for the bank... I am working on getting her onto my medical insurance. Will there be any other costs to get the money out of the bank??? I am in Lagos, and I can't seem to find your office.. I was planning on staying the weekend anyway, so if you don't get this message, I will try again Monday. I brought $30,000 for the bank and $10,000 to pay for Jacky�s hospital bill and to get her all set up to finish her exams. I can't reach her though.. I was hoping to find her today... It's about 4:15, and I am at the Sheraton, here in Lagos... I am glad that they built this one here for us foreign tourists. YOU NEED TO SEE A SHRINK TO EXAMINE YOUR HEAD. I AM SURE SOME NUTS ARE MISSING. What do you mean? I am here in Lagos, waiting to hear from you or Jacky.. I have come all this way, and I have the money.. Why don�t you want to help Jackie? Three months go by without a peep. Oh well� it was fun�.